To be quite blunt, Stardust Crusaders isn’t my favorite portion of Hirohiko Araki’s ongoing JoJo’s Bizarre Adventure saga, as you may have guessed if you read my thoughts on the first half of the anime. It still has the same distinct iconic presence, but it doesn’t always deliver the satisfaction of other parts on a consistent moment to moment basis. There are punchlines that don’t have much punch, clusters of weekly villains who don’t stand out from the crowd, and battles that underwhelm or just plain disappoint. Even then, it’s impossible to say that the JoJo series could go without it — without Stands, without Jotaro and the gang, without those special moments from time to time that have the kind of cult status that are ingrained into the consciousness of anime and manga fandom. Thankfully, the Battle in Egypt arc is more of that. There are more laughs and more thrills and more unforgettably strange and endearing moments spread throughout here than the first half of Stardust Crusaders, and those moments elevate the second half to the glowing peaks of its predecessors. Things aren’t always smooth sailing, but what you get is truly JoJo. So here we are in Egypt, with the crusaders well on their way to finding Dio. But before we get on with that we get another addition to the gang, the crummy little mutt Iggy. Iggy is quite impressive for a dog, swiftly surpassing even the other crusaders in gross selfish awfulness and immediately gaining the ire of Polnareff by chewing his hair out and farting in his face. We learn that Dio has nine more Stand users between him and the crusaders, the first of those being N’Doul and the Stand Geb, who promptly takes out Kakyoin’s eyes and puts him out of action. Unfortunately this is one of the less satisfying Stand battles, lacking in big and engaging moments and ending on a fairly muted climax. 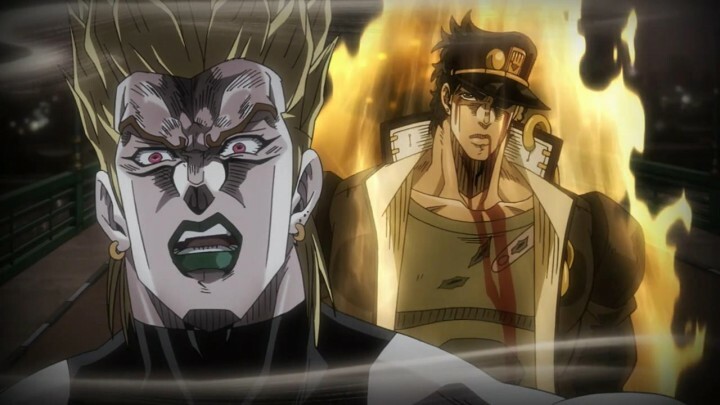 But at least we get left with the moment after the battle where Iggy gives Jotaro his cap back out of apparent gratefulness, only for Jotaro to find a moment too late that Iggy had purposely left his gum in there. That nasty little dog fits like a glove with these dopes. Speaking of these dopes, they really do prove themselves to be the worst company over and over again. Oingo and Boingo are the next antagonists to try their luck. In spite of them being petty and scheming and murderous we get placed in their shoes for this episode, and we end up feeling a little sorry for them. The poor guys don’t even find themselves noticed by the crusaders, and yet the incidental awfulness of our protagonists still ends up being the undoing of Oingo. This “battle”, if you can call it that, is the first of many Stand battles in the Battle in Egypt arc that dares to be a little more experimental, and the results are priceless. Oingo and Boingo’s segment is one of my favorites in the entire series. Oingo and Boingo are neither physically nor intellectually skilled in battle, but they have a book that can predict ominous futures of violent death. Unfortunately, our protagonists aren’t exactly predictable, as we get reminded when Polnareff accidentally burns a café to the ground. 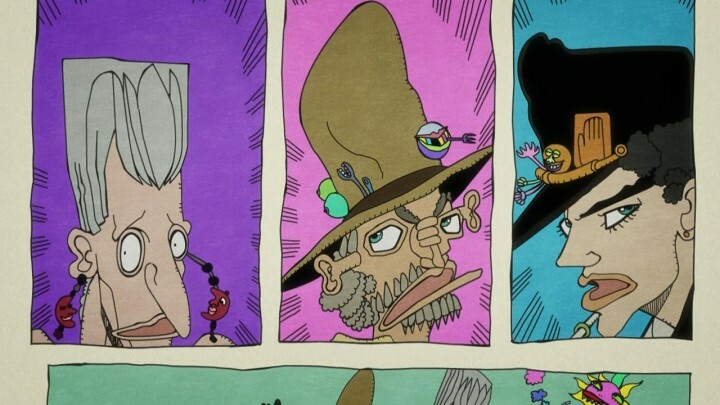 Through an array of screwball happenings, Oingo finds himself pretending to be Jotaro for Joseph and Polnareff. The next thing he knows, he’s trying to swallow five lit cigarettes at once to prove he’s the real deal. He inevitably fails to keep up with the ridiculous party tricks that Jotaro is supposedly capable of, but still isn’t quite suspicious enough for these boneheads to start catching on. 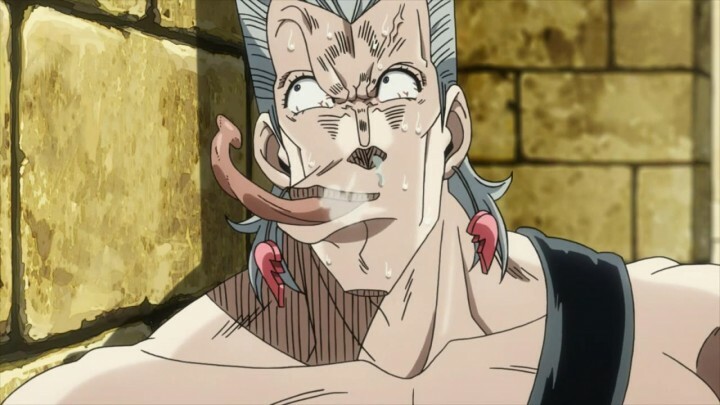 One thing leads to another and Polnareff accidentally blows his face apart, still unaware that he was one of Dio’s Stand users. This is JoJo at its most abstractly surreally hilarious, a segment that continues to prove itself as one of my favorite in the entire series. The next few Stand battles don’t quite live up to the lofty standards of those shining moments, but they keep things running strong. The base ideas of the enemy Stands are all good fun though, bouncing between the sentient sword Stand Anubis, Mariah’s magnetizing Stand Bastet, and Alessi’s age-regressing axe-wielding shadow Stand Set. All of these battles manage to deliver some suitably insane variables, keeping the trademark JoJo tension of impossible odds running higher than most of the first half of Stardust Crusaders. There are also unfortunately some moments that fall prey to JoJo’s worst pulp instincts, such as one uncomfortably prolonged gay joke between Joseph and Avdol when they’re battling Mariah. As I discussed in the first half of Stardust Crusaders, these kinds of things sadly come with the territory of JoJo. In spite of that, all three of these Stand battles come out fairly pleasing, with a strong share of visually entertaining animation cuts to boot. 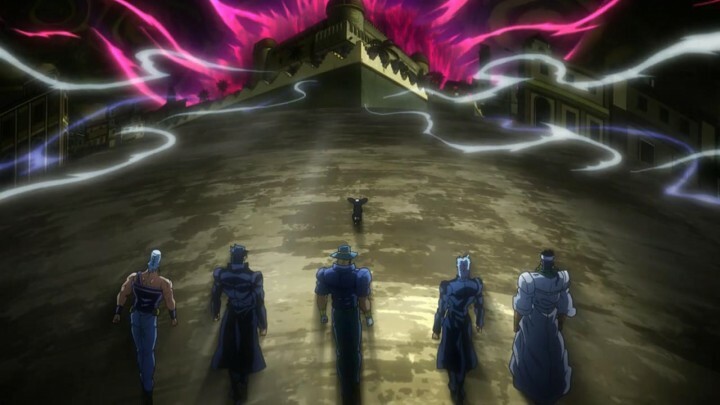 Although it still doesn’t take Stardust Crusaders to the peaks of JoJo’s earlier material, the Battle in Egypt arc gives us plenty of the excitement we expect, delivering a better share than most of the first half. More odds, more laughs, more ambition and more JoJo. If you’re a fan, you can’t go wrong with that. Reaching the midway point, the Battle in Egypt arc gears up for the climax and settles in to a strong groove, delivering consistent hit after hit with each ridiculous, intense, laugh-out-loud hilarious and mind-blowing battle. First up is the mental battle between the crusaders and Daniel J. D’Arby, a crooning expert gambler whose Stand Osiris allows him to wager in souls. One of my favorite quirks of Araki’s work on JoJo is the way he indulgently weaves in his wide range of hobbies and tastes. Araki’s fascination with gambling here finds itself in a strong place within the high stakes and ridiculous innovation of JoJo. It’s also a fantastic opportunity for Joseph to take the stage and show us the charming genius that he’s always won our hearts with. Joseph employs a bet of his own choosing, taking turns with D’Arby to drop coins into a full glass until one of them breaks the surface tension. Joseph attempts to pull one over on D’Arby with a cotton bud, but D’Arby was already two steps ahead by propping the glass up with a tiny piece of chocolate before the game started. For perhaps the first time ever, Joseph’s wits are completely and utterly defeated, stacking the odds against the crusaders more firmly than ever. With the adrenaline pumping and our anxiousness to see how the crusaders will get themselves out of this mess at peak levels, Jotaro steps in for a game of poker. 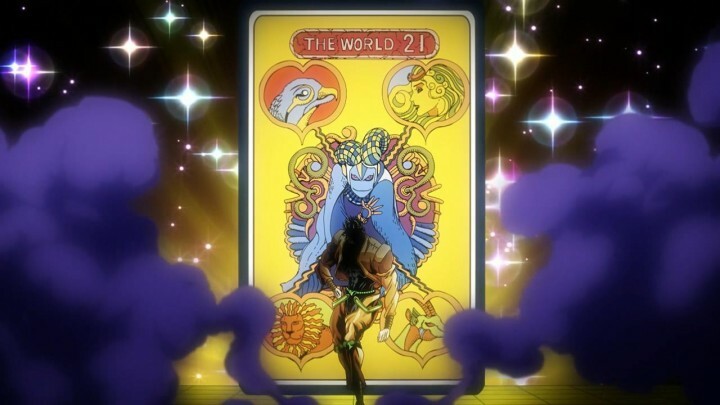 With all of the odds against him and the fix in from D’Arby, Jotaro refuses to even look at his cards. With a stone-faced blind bluff, he gambles the souls of himself, Avdol, Kakyoin, and even his own mother while taking a smoke break and ordering himself a drink. It never gets old watching the luckiest unlucky goofs around. D’Arby is fully convinced that Jotaro pulled off an ingenious trick, and spirals into a nervous breakdown at the thought that he’s going to lose. The visual representation of this breakdown with D’Arby’s blurring, shaking, scribbled pale crimson figure is perhaps more bone-chilling than any of the plethora of body horror scenes this series has pulled off, and the adaptation elevates it further. 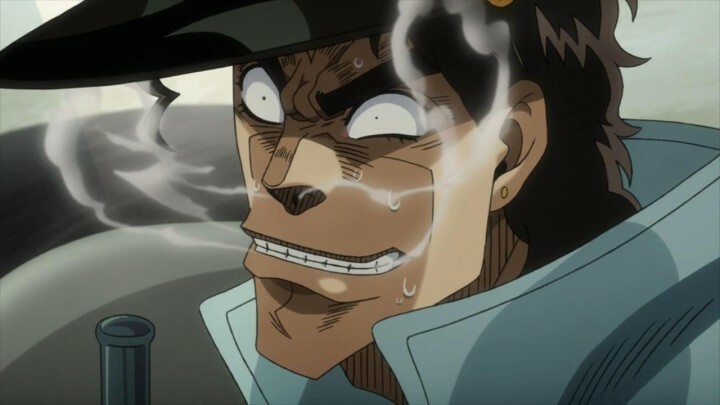 Jotaro pushes D’Arby into submission, only to have second thoughts afterwards about his giant bluff when he finds out his hand was absolute garbage. It never gets old seeing our protagonists play the role of the luckiest unlucky goofs around. Next up, the Battle in Egypt arc treats us to the return of Boingo and the somehow-still-alive Hol Horse, who form an unlikely dysfunctional duo and set out to defeat those meddling crusaders. Its slow start keeps it from being the hit that Oingo and Boingo were, but it’s still a wonderful battle that offers a fun change of pace from the high stakes intensity and mind games of the previous battle. It’s actually kind of a battle this time around, but with variables that are absolutely boneheaded even by JoJo standards. But what do you expect from a battle where Hol Horse sticks his fingers up Polnareff’s nose? 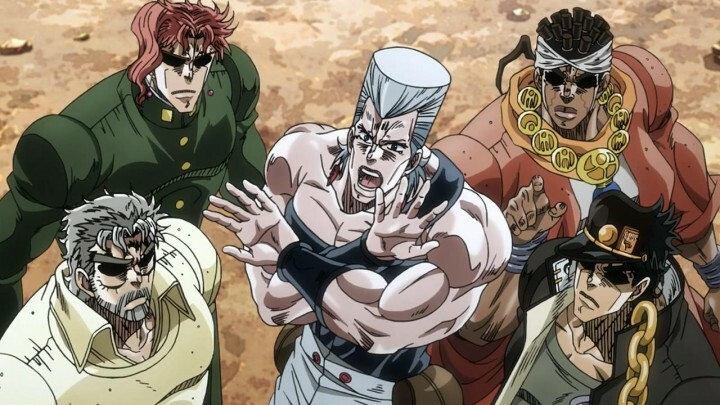 Polnareff is taken hostage, but he manages to escape not by some genius strategy but instead by a conveniently timed sneeze. Hol Horse’s undoing is when Boingo’s Stand Thoth predicts him shooting Jotaro through the skull at noon sharp. Tragically, the bullets miss; Hol realizes too late that his watch was running fast and the bullets that missed Jotaro come flying right back at him. Good night sweet Horse. Boingo realizes that he’s hopeless as a villain and decides to change his ways, only for Araki to decide that he wants to be mean by sending Iggy to give him a beatdown. Araki is one sick man, but I guess we already knew that. 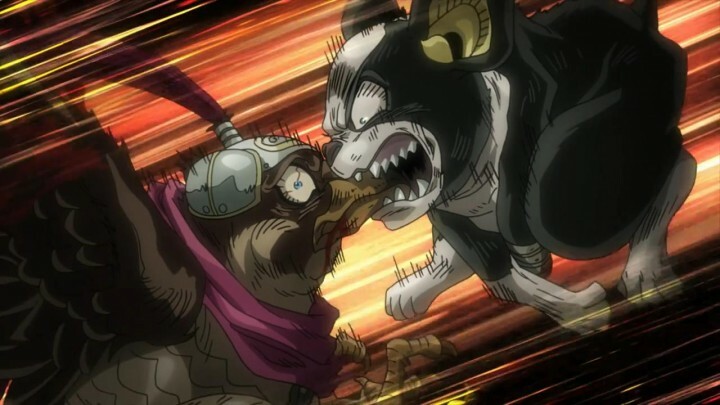 Taking us back to the serious business, the Battle in Egypt arc pulls off one of the best experiments in Stardust Crusaders by putting us in the headspace of our selfish mutt Iggy, fulfilling Araki’s penchant for animal violence by pitting him against Dio’s falcon Pet Shop and the Stand Horus. What follows is JoJo at its best in a truly bone-chilling action thriller, leaving goosebumps on goosebumps on goosebumps with the raw intensity of every twist and turn. It’s elevated further by Iggy just being a really fun character to get into the head of, who’s less about the macho bravado of the other crusaders and more about figuratively and literally saving his own tail. But for just one single moment Iggy makes a tragic mistake of feeling for a human being. Pet Shop just killed a young boy’s dogs (bringing our dead dog tally for this part to around thirty), and although Iggy wants to go on his way without arousing suspicion, his semblance of conscience kicks in and he saves the boy. His reasoning is that he “can’t just stand by and let a boy who likes dogs get killed”. Just like that he’s put himself in a sticky situation with one terrifying bird and its piercing inescapable glare. The battle takes us underwater in perhaps the first and only action scene in existence to ever pit a dog and a falcon in a violent brawl on the ocean floor. Iggy gets the final laugh, though, crushing Pet Shop’s beak with his bare teeth. Iggy can’t swim back to shore, and comes to terms with his death. His life flashes before his eyes, his dream of living a carefree life crushed. But then, in a glorious full circle moment, the boy he saved earlier comes to return the favor and Iggy gets to live on. And so we end this vicious battle between a bird and a dog on a strong high note. With Pet Shop out of the way, a wounded Iggy reunites with the rest of the crusaders, followed by the surprise return of Kakyoin, who now sports a cool new pair of shades. With the band back together, they head for Dio’s castle. We get a nice montage of everything that’s happened in Stardust Crusaders leading up to this point, and everyone’s thoughts hell-bent on putting an end to Dio are narrated to us. Jotaro nonchalantly breaks the fourth wall by replying to the narrator “In other words, if we beat the **** out of Dio right here and now, it’ll all be over”. The time has almost come. So basically, JoJo just became really awesome again. There is such great innovation with the fundamental variables of these battles, with each weird experimental idea consistently on point in virtually every aspect of delivery. All the chills and thrills and spills we’ve come to expect from the enigmatic JoJo are back in full force, and it’s great to see them again. Dio’s mansion stands right before the crusaders, with their final grand battle inching closer and closer. But before they get to Dio they have more obstacles to get through. Their first encounter is the butler Terence T. D’Arby, the younger brother of Daniel D’Arby. Terence isn’t the crooning swindler his older brother is, but he’s ten times the sociopath, beating his opponents at video games and putting their souls in haunted shabby dolls. Although it isn’t as intense as the previous battle with his elder brother, this battle keeps the momentum that’s been building up to this point running high. First up is Kakyoin, who decides on a racing game. JoJo does a wonderful job forming its variables around all kinds of weird mechanical exploits that you expect in games like these. There’s a speed-boost tunnel that only one racer can fit in, so Kakyoin tilts his kart and clings to the ceiling. Then later on Kakyoin finds his demise when he spins out his cart in an attempt to knock D’Arby off the track, only to find out that D’Arby was using him to fly to the other end of the track. They’re simple exploits, but they make for nice dramatic twists while also giving the vivid sense of two seasoned players battling it out in a real video game. Jotaro is next to play, choosing a baseball game that happens to be D’Arby’s best game. There’s just one problem: Jotaro has never played a video game in his life. With two clean outs and his third player on the final strike, Jotaro casually proclaims “I’ve pretty much learned to bat now”, and hits four consecutive home runs. Gamers who put in years and years to get good at games be darned. D’Arby eventually corners Jotaro with his mind-reading abilities, but then Jotaro starts declaring his pitches. Although D’Arby can determine what pitch Jotaro is going to throw, the pitches end up totally different. He knows that Jotaro is cheating, but unlike his elder brother he can’t prove it and gets driven to madness until he admits defeat. 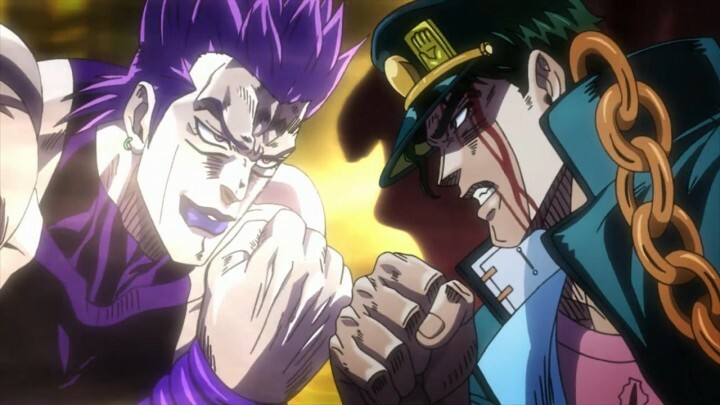 Once it’s all over he figures out too late that Joseph was playing the game with Hermit Purple, and then Jotaro gives him a vicious beating for his troubles. There’s nothing glamorous about our heroes, but they get the job done. Meanwhile Polnareff, Avdol, and Iggy are finding their way through the mansion. Avdol boldly declares before they enter that no matter what happens in there he won’t save either of them. But JoJo likes to be tragically mean to us at times, and Avdol ends up sacrificing himself to save Polnareff and Iggy from Dio’s right hand man, Vanilla Ice. Out of all the ridiculous characters that humorously date the earlier parts of JoJo as being distinctly Eighties-influenced, Vanilla Ice still manages to be one of the more flamboyant ones, rocking a sleeveless denim jacket and thong and thick long Fabio locks. His Stand Cream is as terrifying as his looks, completely disintegrating everything in its path. After surviving a bullet to the head, there weren’t many ways to make Avdol dying a second time dramatically effective, but holy heck this was one of them. 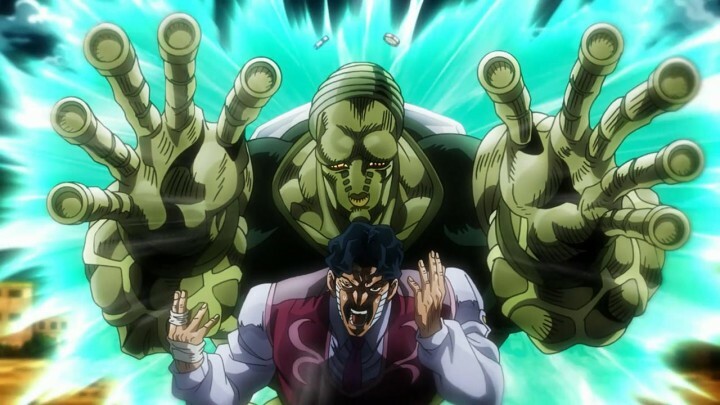 The sheer gravity of the situation is nailed in with obscene cruelty by Avdol’s remaining lifeless arms, which Cream then proceeds to slowly devour. This is Araki’s way of saying “yep, he’s definitely dead!” There’s a distinct emphasis on Polnareff and Iggy’s panicked breathing, really nailing it in that they’re up against one absurdly powerful villain who they don’t stand a chance against. This entire battle is one of those big moments in JoJo where it swings for the fences in macho melodramatic glory, and it hits the mark big time. Iggy and Polnareff are gradually broken down into a pulp and Vanilla Ice looks to deliver the final blow. After all the trouble he’s caused, Polnareff decides that he wants to be the hero for once, and tries to risk his life for Iggy. 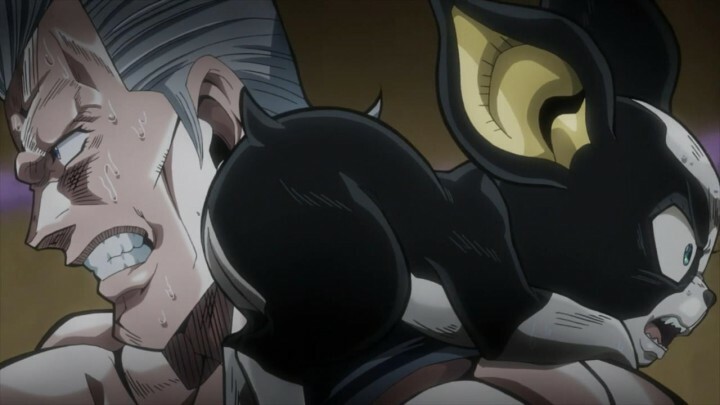 Everything cuts to silence as Polnareff admits defeat, but as we come back to the scene we learn that it was Iggy who ultimately sacrificed himself. 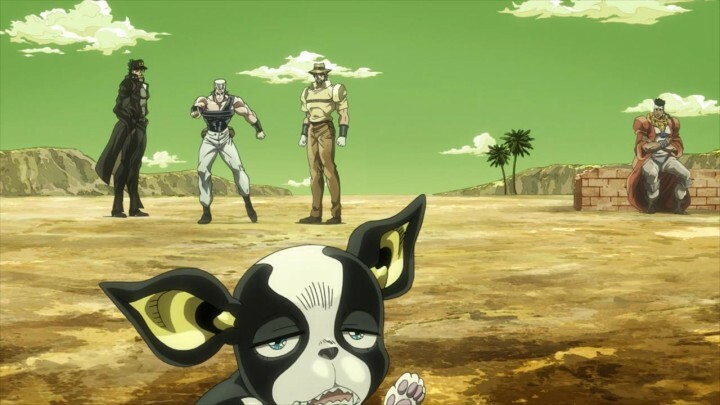 After all the absurdly horrifying things JoJo has done to dogs right from the very beginning — starting with roasting young Jonathan Joestar’s little Danny in a furnace — Araki finally pays respect to our canine friends, letting Iggy have this great noble sacrifice. I couldn’t help but shed a tear for this glorious moment. Polnareff returns the favor for Iggy and swiftly defeats Vanilla Ice, ending this battle once and for all. In all the tension of these situations we come to realize that not only do these ridiculous characters care for each other but more importantly we care for them. Somewhere along the line, this farting dog and this dopey Frenchman became important to us. As Polnareff looks on at the image of Iggy ascending in the clouds along with Avdol, I couldn’t help but shed a tear for this glorious moment. With the epic climactic battle with Dio in the wake, the Battle in Egypt arc shows that it’s ready. The high stakes have been made resoundingly obvious, and the emotions are running high. 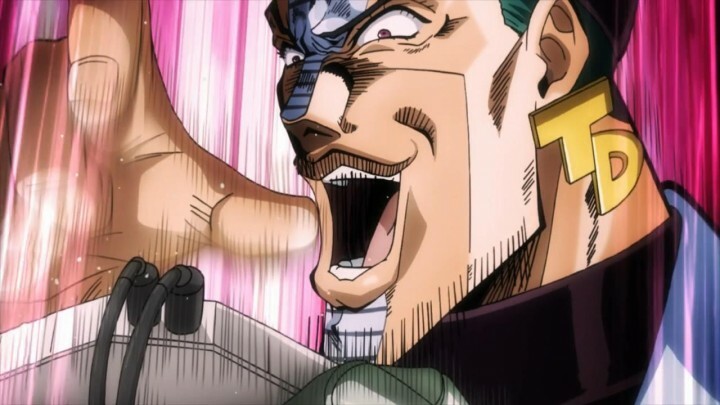 Stardust Crusaders looks to deliver one heck of a finale. So here we are at the big final battle with Dio. Put simply, it delivers. It feels important, it feels like all the nonsense we’ve been through these past forty-something episodes has all built up to this one moment. And boy is it the most wonderful pile of nonsense you’ve ever seen, with all of the high stakes and variables coming together into one of the most unimaginably crazy and exciting battles in all of JoJo. Polnareff is the first to come into contact with Dio, who’s even more ridiculously powerful than ever. He’s also still kind of a jerk. 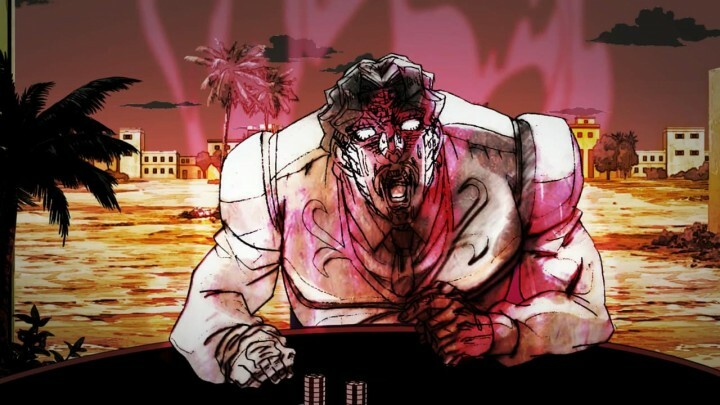 In case you forgot the entire first part of JoJo, the Battle in Egypt arc reminds you that Dio is really, really evil. 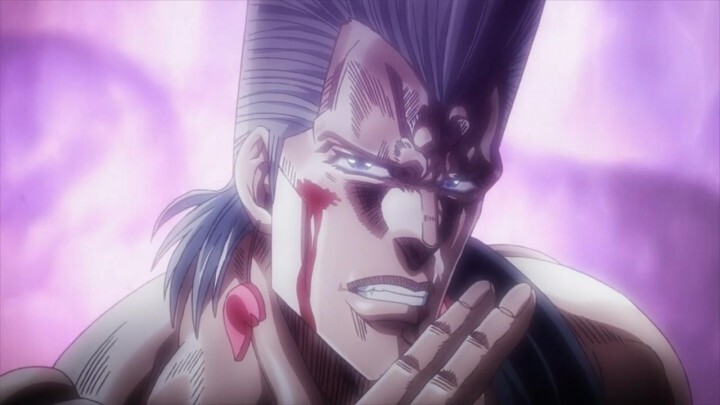 His most engaging quality is simply how much he enjoys being evil, which we see when he tries to cast seeds of doubt in Polnareff by using his Stand, The World, to make Polnareff believe he’s subconsciously moving away from him. By shounen manga standards where “the courage to fight” is the utmost prized ability, this just might be the most evil thing you can do. Then in a car chase with Joseph and Kakyoin, Dio chooses to hijack a Senator’s limo, rip his front teeth out, break his nose, and force him to drive on the sidewalk during rush hour. He just might be the evilest evil man to ever unleash evil. Back to my original point, Dio is terrifyingly powerful. Kakyoin puts everything on the line so he can corner Dio and attack him from all sides, only for Dio to brush it aside in an instant and send him crashing to his death into a water tower. In his final moments he finds out the secret to The World, which as everyone already knows by this point is the ability to stop time. 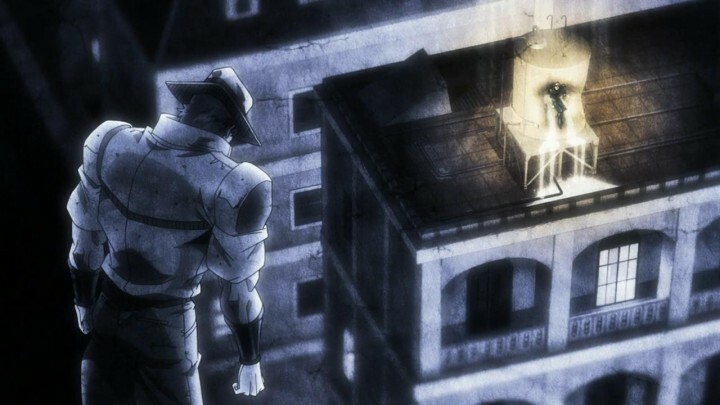 Just like Avdol and Iggy before him, JoJo gives Kakyoin a hero’s death, Kakyoin using his last burst of energy to blast the clock tower as a warning of what Dio’s ability is. 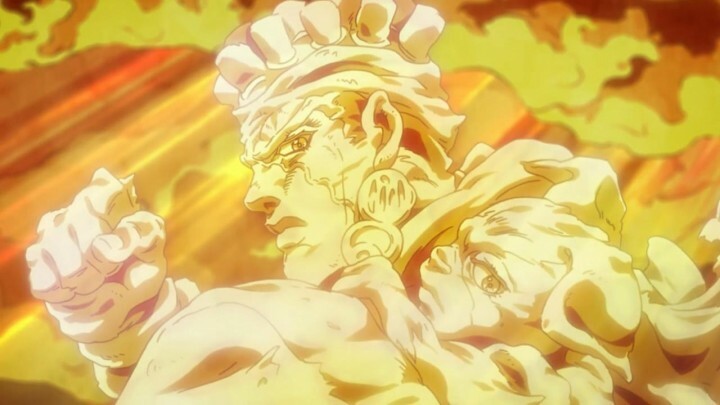 Joseph eventually connects the dots and tries to use it against Dio, but ends up completely outmatched. 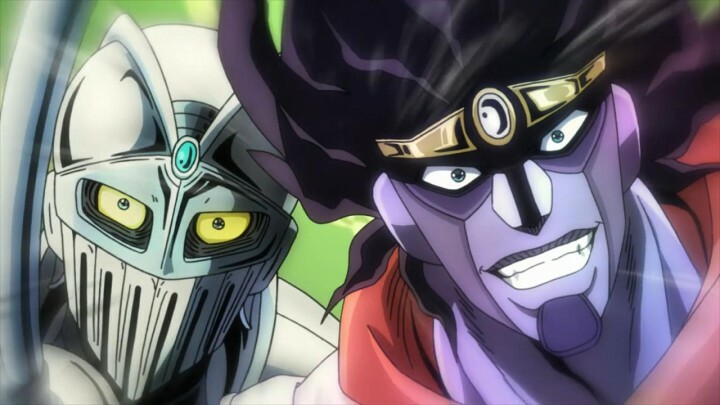 One of his ridiculous strategies is to use Purple Hermit to surround himself in Hamon-infused thorns, but unlike all the other villains before him, Dio is able to catch on immediately to Joseph’s corny tricks. It’s a really great twist on the formula that’s been prevalent up to this point, making it even more resoundingly clear that Dio is truly the final boss, so to speak, of Stardust Crusaders. 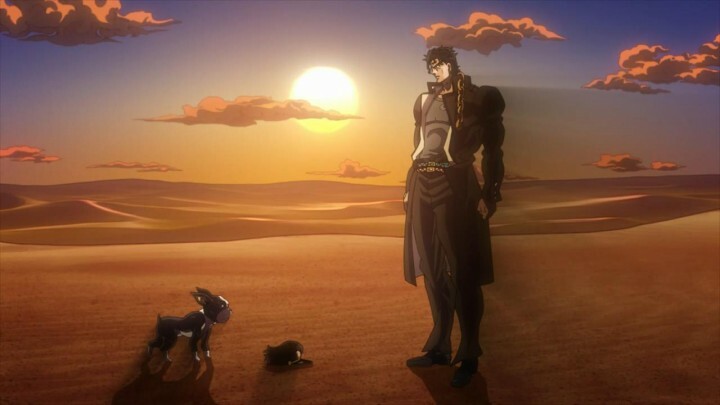 Joseph reaches Jotaro and tries to warn him about The World, but in an instant Dio freezes time and kills him, stopping to kill a cat on the way of course. Almost effortlessly Dio has just killed two of our protagonists, both of whom have been with us for a long, long time. This guy is the real deal. So now we’ve reached the final iconic battle between Jotaro and Dio — two almost evenly matched super-powered freaks. Dio is quick to find out that his Stand is stronger in every way, but if JoJo battles were that simple I wouldn’t still be here. This is where the big guns come in, and all the ridiculous twists and turns reach a crescendo until they’re coming one after the other like rapid fire. Jotaro moves his fingers while time has stopped, so Dio starts to think Jotaro can also stop time. He realizes that Jotaro was playing a dumb trick on him by putting magnets on both of them, believing that Jotaro was fooling him into believing that he had the same powers. It turns out that it was exactly the opposite, and Jotaro was actually fooling Dio into believing that he couldn’t stop time. Dio can still stop time much longer than Jotaro, and uses that to his advantage to instantaneously launch dozens of knives at all of Jotaro’s vital spots. Jotaro survives because he stuffed his clothes full of magazines earlier. How in the heck did he do that, you ask? Who knows? It sure is awesome, though. Dio isn’t silly enough to believe a Joestar could die so easily and tries to make sure that he’s dead, but then Polnareff makes his grand comeback and lodges Silver Chariot’s blade right through Dio’s skull — sadly not doing enough damage and just ending up with Polnareff beaten to a pulp. Jotaro has to save Polnareff, so he taps the ground to move Dio’s attention away. Jotaro goes as far as to use his Stand to stop his own heartbeat so Dio still thinks he’s dead, and then gets Dio to come in close and crushes his skull. Dio plans an escape route by car, but Jotaro stops him. He tries for the sewers, but Jotaro is already waiting there with the one-liner “This place is already taken.” Jotaro beats him to a pulp and sends him flying…in the direction of Joseph so Dio can take his blood and reach his ostensible final form. Just by writing this I’m being sucked into the insane energy of this battle. One after the other, these twists are dizzying and mind-blowing and oozing with JoJo’s brilliance, not only worthy of a climactic finish but surpassing all expectations of one. Then to make things crazier, Jotaro gets a spiritual message from Joseph, telling him not to lose his temper when battling Dio. But then he does, and Dio sends him crashing through half a dozen buildings. Dio stops time again and disappears completely, and then suddenly ROAD ROLLER! Even on my fourth or fifth viewing of this scene, and even having already been spoiled this moment due to its memetic status before I even read the original manga, this moment remains one of the most maddeningly silly and gut-bustingly hilarious moments of the entire series. The simple idea is funny and absurd enough, but the spontaneity of this scene both in the original manga and in this adaptation elevates this moment to a godlike status. Dio thinks Jotaro is done for, but then Jotaro finally reveals that he can also stop time. Jotaro proposes a final standoff, to which Dio responds by splattering blood in his eyes and going for a cheap shot. Jotaro, as Jotaro does, blocks the shot with a punch so devastatingly powerful that Dio bursts into two. The reason Dio lost was simple, in fact mind-numbingly obvious. 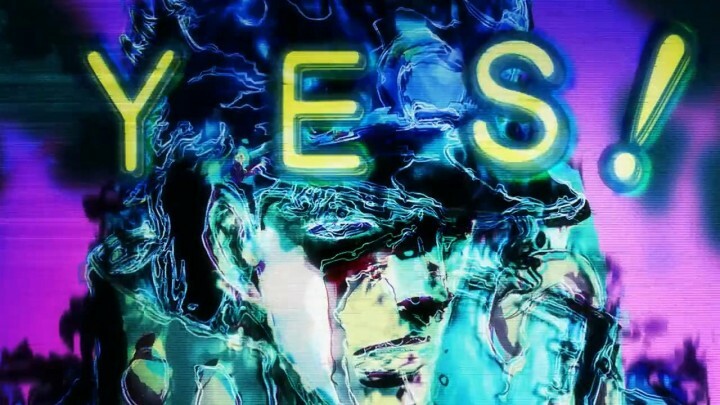 As Jotaro puts it himself: “You really p***ed me off.” And so we say farewell to one of the greatest Stand battles to ever grace JoJo, a mesmerizing explosion of wonderful dramatic twists all leading up to a climax every bit as awe-inspiring and funny and downright insane as a JoJo climax deserves to be. The day is saved, and the Speedwagon Foundation goes to rescue Jotaro and Polnareff. But before Jotaro puts this whole thing behind him he tells the doctors that he wants to put Dio’s blood in Joseph’s body to bring him back to life. “Impossible,” they say. “He doesn’t have a pulse!” they say. But to that Jotaro emphatically states “We did a lot of impossible things on this journey”. In other words, this is JoJo. Of friggin’ course you can bring someone back from the dead with a simple vampire blood transfusion! And well, it actually works, but Joseph being Joseph uses the opportunity to fool Jotaro into believing that he just brought Dio back from the dead. Jotaro doesn’t take it very well, and Joseph has to prove who he is with his useless knowledge of Bo Derek and Weird Al Yankovic. As always, by the time you start to wonder how these situations even came about you’re in stitches, and personally I wouldn’t have it any other way. We sure as heck don’t want this journey to end. 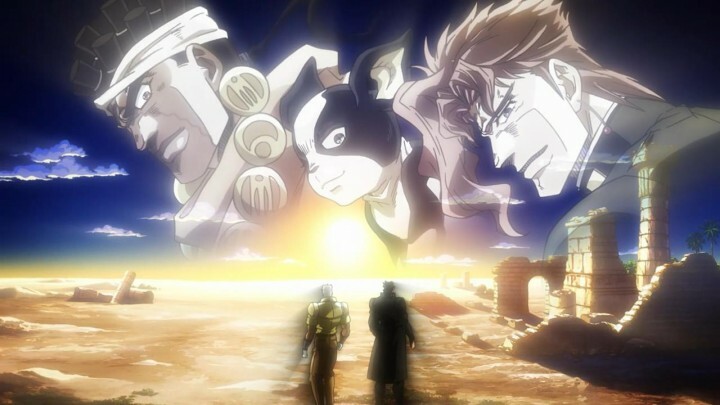 Our remaining crusaders Jotaro, Joseph, and Polnareff all say goodbye and part ways, sharing an embrace and some tears. JoJo has always been too flamboyant to be hyper masculine, and it’s not afraid to show us that our big muscle-bound heroes are actually real softies deep down. 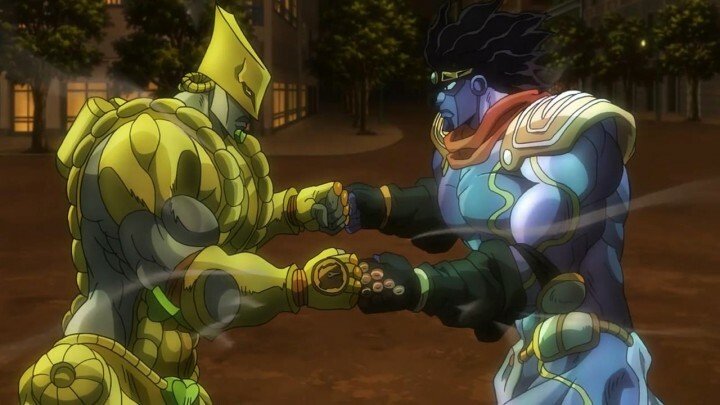 In parting, the Battle in Egypt arc shows us once again that JoJo really can sell these big sentimental moments, because whether it’s admiration or pity we really care for these silly people. We want to spend more time with them, and we sure as heck don’t want this journey to end. Of all the impacts that Stardust Crusaders leaves, that’s perhaps the most profound. 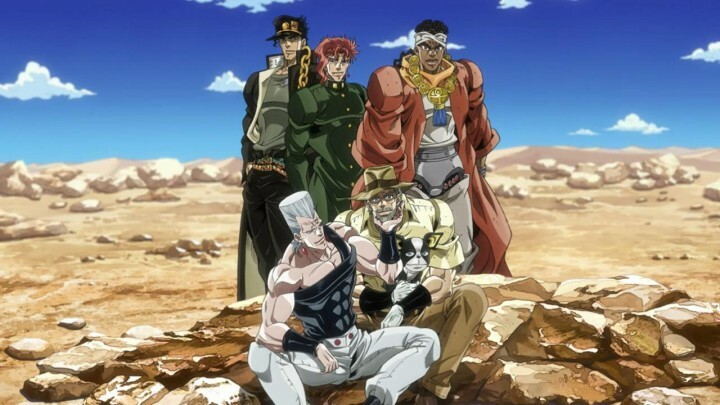 The Battle in Egypt arc brings the Stardust Crusaders saga to an extremely satisfying conclusion. It’s punchier, it’s funnier, it’s weirder, and it’s more focused. When the time comes it really goes the extra mile, and even manages to be the most bizarrely touching that JoJo has ever been. If you’re willing to put up with a few duds to get here, I guarantee you that Stardust Crusaders: Battle in Egypt will make you love it.